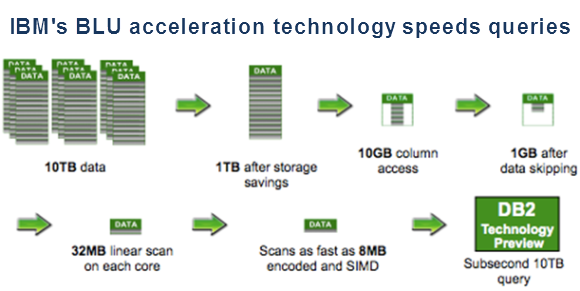 Because of BLU, DB2 10.5 could speed data analysis by 25 times or more, IBM claimed. This improvement could eliminate the need to purchase a separate in-memory database—such as Oracle's TimesTen—for speedy data analysis and transaction processing jobs. "We're not forcing you from a cost model perspective to size your database so everything fits in memory," Vincent said.